Młoda Kapusta Zasmażana – Fried Cabbage – Vegan Mofo Day 2 – vegan in your city. Fried Cabbage, sounds boring right? No. It’s not. It’s hearty and warm and cozy. There is this fantastic balance of sweet and smoky and lightly salty. The smoky tofu bacon really brings this all together, but any kind of fried meatless sausage type product would work great in this too. 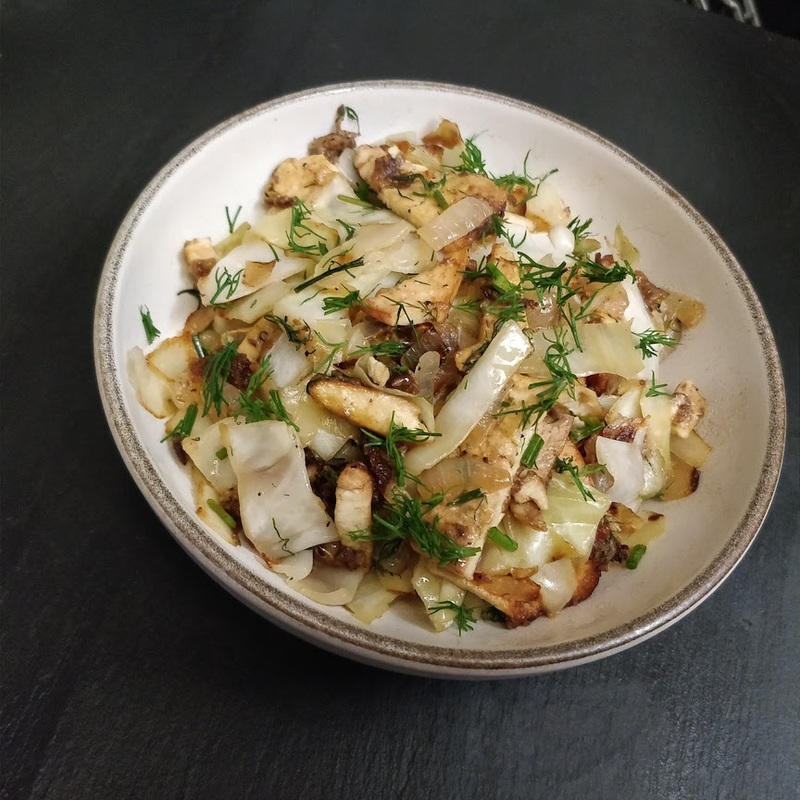 I really like the Tofurky or Yves Kielbasas for a quick comforting cabbagy meal – just slice them into half moon slices and fry them with some onion and then add sliced cabbage and onions. 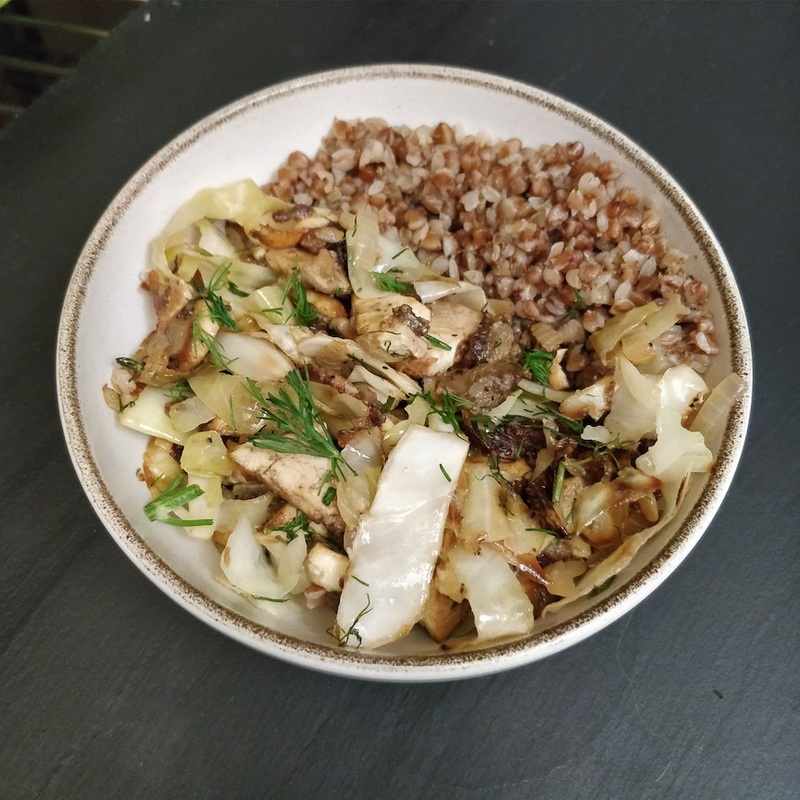 It all pairs wonderfully with kasza gryczana (lightly roasted buckwheat groats) or boiled/mashed potatoes. I’m calling this a young (młoda) cabbage (kapusta) because the one I used was dark leafy and green and fresh off the farm despite being the beginning of autumn. If you’re deep in the middle of somewhere else, can’t find deep green young cabbage, but can find Napa cabbage, its tender leaves might fit the bill. I’ve got other plans for the rest of the cabbage – as there are always other things to do with cabbage in Polish cooking – it is a very versatile vegetable – featured in some of my favourite things like cabbage rolls, sauerkraut, a variety of soups and stews, and more! Add sesame oil, liquid smoke, soy sauce and (optional) mushroom powder to a bowl, add the tofu, marinate for 15 minutes and then toss all into a frying pan on medium. Let this fry up until lightly browned and then set aside. Use the same frying pan for the cabbage and onion. Add oil to frying pan if using, then add the onion and cook until translucent, add the garlic and stir until fragrant. Toss in the cabbage and cook for around 7 minutes until everything has had the opportunity to blend and mix. You want the cabbage to still have a bit of a crunch to it. Add the vinegar. Roughly chop up the smokey tofu pieces and mix in with the cabbage. Let them fry together for a bit and then mix in the chopped dill. Give everything a stir and then turn off the burner. You can serve with buckwheat groats or potatoes or just by itself in a bowl.